Hearing about the recent addition of Coolhaus ice cream sammies at BareBurger, I was eager to try them out – especially since I haven’t had a Coolhaus treat in so long! Dan and I went in today on the fly and watched a little of the World Cup – Dan getting a beer while I had my eye on the prize, the ice cream. Bacon Chocolate Chip Ice Cream Sammy – When I first heard they had this on the menu, I didn’t think about anything else and immediately declared my sammie of choice. Our server praised me for this selection and in just a few minutes brought out a large, luscious ice cream sandwich with a side of maple caramel sauce. We had them split this baby in half, as you can see how large it was. Each bite was heavenly, and had just the right concentration and essence of bacon – while it wasn’t overpowering, the flavor was just enough to get you thinking about it and to relish in the smokiness. The caramel sauce too was a thing of beauty, reminding us of something you’d have while camping with friends. We experienced great service, which isn’t out of the ordinary here. The BareBurger staff has a great thing going in terms of their overall team dynamic, including a nice rapport with customers. I liked the relaxed vibe of the afternoon, which is pretty rare for BareBurger, and we hung around for a little while watching a bit of the Colombia/Costa Rica game. 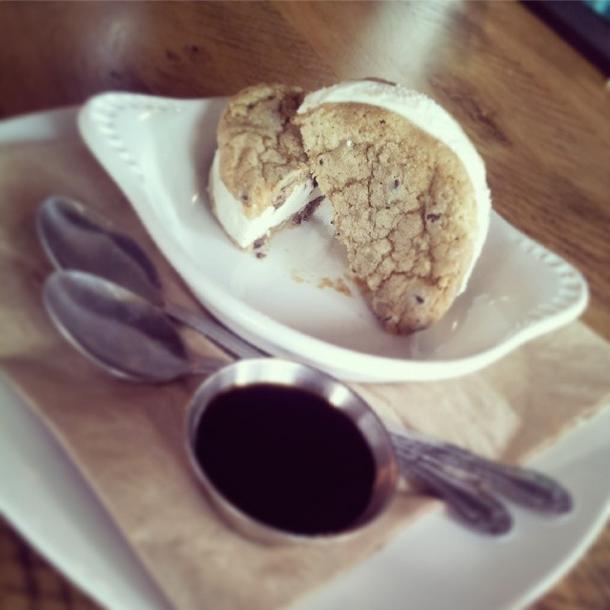 Each ice cream sammie will set you back $7, which is totally worth it, especially if you split it with a friend. Be prepared to lick your fingers clean!